Day 40 & 41: We made it! Well, we decided to power through the last two days and get home. Not a whole lot to talk about the last couple of days except that we drove and drove and drove. We spent night #40 just outside of Boise, ID, got up early the next day, and just powered through. Made it home about 4:30p pacific time. In a day or two, after I’ve had a chance to decompress, and clean the motorhome up a bit, I’ll do a final post for the trip that will include my thoughts on various parts of the trip, as well as a bunch of stats (because everyone loves stats). Got to a bit of a late start today – Kim made cinnamon rolls for breakfast. That is definitely worth a late start. We got on our way and headed to four corners. The drive was about an hour and a half and pretty uneventful – we did drive through Arizona for about 10 minutes, so we get to check off one more state on this trip. The actual Four Corners monument is so-so – if you are heading through the area (not likely) it is worth a stop. If you use modern tools to figure out the location of the monument, you wouldn’t find it because the monument is technically in the wrong place. However, it is the spot that surveyors have been using for the last 100+ years and it has stood several court challenges and won. It was too crowded to get a picture touching all 4 states at once – but the kids had fun looking through all of the Indian vendor shops around the edges. We drove through some of the coolest terrain that we’ve seen on the trip. South Utah is just plain cool. I want to come back on my motorcycle and do some serious riding out here. We stopped for the day in Green River, UT. The kids jumped in the pool for a bit before we went to dinner. There was a cool little restaurant right on he Green River that we ate at. We had window seats and watched a thunderstorm off in the distance while we ate dinner. Tomorrow, we should be stopping somewhere in Idaho. We are just over 1000 miles away, so we could probably get home in two days if we pushed hard, but I think we will try and make it in three. Our goal is to spend the last night in Yakima, and get home fairly early on Thursday. More driving today, and more uphill at that. Spent much of the day at or above 6000 feet. You know you are in the mountains when you are at that altitude, and there are still mountains higher than that around you. We also crossed the Continental Divide today. I thought about getting out and peeing on the sign to make sure it was in the right place, but I don’t think Kim would have approved. Coming north out of Albuquerque, we hit some thundershowers. Nothing too dramatic, but enough to turn the windshield wipers on for a bit. We are staying in Bloomfield, NM tonight. Another ok RV park, although it was too hot to go out and do anything when we stopped for the day. Tomorrow we are going to visit the four corners, and then head up to Green River, UT. Not a super long travel day (distance wise)…getting closer to home though. Should still make it by Thursday. I’ve been slacking on updating the blog, so here are 3 days at once! As always, stopping for fuel is a ton of fun. We got everything lined up in a station that was kind of tight, and then the pump was out of order! No problem, there was a station across the street, but the pumps were facing the wrong way (when the pumps are perpendicular to the station building, we can’t make the turn to get out once we’ve filled up) – however I could use the outside pump and sneak around the outside of the building to wrap around and get back on the road. Since we take 60+ gallons every time we fill up, we go inside and give them our credit card so they can just turn the pump on. Of course there was a huge line of people with one person working the register – it took about 10 minutes to get through the line. I start to fill up and then the pump stops at $200. So, I have to go in and sign for it and have them turn on the pump again. While all this is happening, the Hostess truck shows up to stock the store – and blocks my exit! I finally get things filled up and try to sneak by the Hostess guy, and I just can’t make it. Fortunately the driver comes out to leave, but takes his sweet time doing it. This fuel stop took about 2x longer than normal! We are staying at the Vineyards Campground on Lake Grapevine, or at least the RV is staying there. Robin insisted that we come stay at her house. The campground is actually quite nice, right on the lake. Our spot doesn’t have any shade though. The offered to move us to a new site on Thursday, but since we aren’t actually staying in the motorhome, we declined. We packed everyone up into the Jeep with their stuff (which is a bit of a challenge in the Jeep) and drove over to Robin’s house. The kids all jumped in the pool and Robin made us some awesome pulled pork for dinner on Wednesday. Kim and I got up early and went back to the motorhome to do some work. The rods on the tow bar were no longer retracting. I had lubed them up a ton, and they still wouldn’t slide. I was about to give up when I did the unthinkable – I read the manual. According to the manual, no matter what you do, do not lubricate the locking mechanism with a silicon based lube. It attracts too much dirt and the tolerances on the locking mechanism are so tight that the bars won’t unlock…uh I guess I shouldn’t have done that. Fortunately, it also told you how to fix the problem since you didn’t read the manual in the first place. Repeated soaking w/WD-40 will clean things out and everything should work fine. Well, I didn’t have any WD-40, so I had to run to the local auto parts store. After soaking multiple times and banging on them with a rubber mallet, things started to work again. Once I got things lubed up properly, they are working the best they have all trip. The kids all wanted to hang in the pool at Robin’s house, so Kim and I decided to drive down to Cowboy Stadium and do a tour. The stadium is pretty unreal. You see the big screen on TV and think it looks big – in person, it is huge and it has an amazing picture. For the self-guided tour we were doing, they actually let you go down on the field – so we did :). We went into the cheerleaders locker room and the cowboys locker room. It was a good tour and would recommend to people visiting the area. Today, Robin was kind enough to set us up with a tennis lesson. Of course, it was at noon, and it was over 100 degrees outside (and probably much hotter on the court). I was hitting the ball pretty well for not having played in over a month. Maybe this tournament next weekend won’t be a disaster. After getting done with tennis, we went back to Robin’s house and jumped in the pool – all of our clothes were in the laundry and we were nasty from playing tennis. We hung out in the pool for a couple of hours, which was nice in the heat. After the pool, we went out to dinner with Kim’s relatives (Nick, Marilyn, Brent, and Brent’s girlfriend Jessica). The restaurant we went to was called Hard 8 Barbq – it was very good. 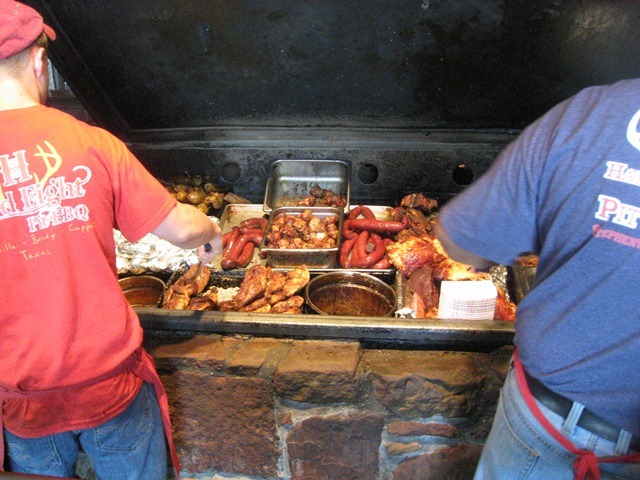 They smoke/cook all of the meat outside. You picked out your meat outside and they put it on your plate, and then moved inside to get your side dishes. The food was awesome! We are back at the RV tonight, we start the power drive home tomorrow – 6 consecutive days of driving. It turns out they do a fireworks show every Friday night. So we watched the show – it lasted about 15 minutes…I wonder how they fund it on a weekly basis. Today was another driving day…long driving days are tough to blog about because not a lot of interesting things happen, so I’ll try to be creative and interesting…of course have kids with us helps, because they like to do “things” in creative and interesting ways. Such as, placing an open pop bottle on the shelf behind the couch – did I mention that there is a gap between the back of the couch and the shelf? No, the bottle did not fall over and leak behind the couch, the whole bottle fell behind/under the couch. Or, while we were driving there was a loud thump in the back of the rig. I love hearing loud noises while I’m driving because that usually means something broke and get to be creative and fix it (ok, maybe not). One of the kids (who will remain anonymous) was kicking the table post and ripped it out of the mount. Kim jammed it back in place until we stopped for the night. Fortunately, I could just rotate the post 180 degrees and screw it back into the mount. Not everything exciting was related to kids. I pulled off the ever popular U-turn of a 35 foot motorhome while towing another 20ish feet of Jeep. While we were in the middle of nowhere Mississippi, we needed some fuel, and the gas station was on the wrong side of the road on a divided highway. Pulled in ok, but I had to go the wrong direction (compass wise, not flow of traffic) to get out of the station – at the next gap in the median a flipped a u-turn. Fortunately, it was 2 lane going both directions and not a lot of traffic. And the final issue, the brake monitor started flashing, indicating the Jeep battery was low. This shouldn’t happen since I’ve got the cool remote charger on the Jeep, that keeps the Jeep battery topped off while we are going down the road. I checked the remote regulator in the Jeep, and it indicated that the batteries were being charged. When I looked at the brake itself, the LEDs were all flashing like something was wacky. I unplugged the brake and plugged it back in again, and that seemed to fix everything. Even though the battery level appeared to be up on the Jeep, I ran it for about 15 minutes just in case. Did not have any problems for the rest of the drive. Starting to head toward home. We got up at 7:30a this morning to make our break out of town – still didn’t get on the road until a little after 9a. Fortunately we gained an hour back today, and we spent the extra time on the road. About 45 minutes after getting on our way, the indicator lights on the Jeep brake monitor started flashing. We pulled over at a grocery store and checked things out in the Jeep, and everything seemed fine. The manual for the brake did not list an error for that set of lights. So, we unplugged the monitor and plugged it back in and it seemed to fix everything. We’ve committed to getting home on July 28th. Kim and I entered a charity tennis tournament that starts on the 29th, and we don’t want to forfeit our entry fee. We are shaving time off by going about 100 miles more a day than our plan. This should shave off enough days to get us home in time. The campground we are at tonight has nice level sites, but there really isn’t much for the kids to do here. We kicked them out of the rig when we go here and there was just a two person swing under a tree for them to go play with. Kim and I hit the laundry room – we hadn’t done laundry since Myrtle Beach and we all were running out of clothes. Tomorrow we should be going through Alabama and Mississippi before stopping in the middle of Louisiana somewhere, and then we’ll be on to the Dallas area the next day! Day 30 and 31: It’s Been a Month! Got up early to go on the Forbidden Journey ride in the Harry Potter section of the park. We went straight to the ride and there was already a 20 minute wait. Turns out, it takes about 20 minutes to walk through the castle to get to the front of the line . The ride itself was kind of interesting. It was a cross between the Haunted Mansion and the old Back to the Future ride. You were in a chair that went along a track. The chair would rock and roll in all directions, and occasionally you’d stop in front of a big screen and it would turn into more of a motion ride. Overall it was pretty cool – my only complaint is that I couldn’t follow the story for the ride. We split up for a bit – Ryan and I grabbed some breakfast, while the girls went on Dr Doom again. Then the girls went into the main gift shop while Ryan and I went back to Harry Potter for a bit. After the girls were done shopping, they went over to the other park. When Ryan and I were done w/Harry Potter and walking out, Melissa called – Kim lost her phone. Well, I went to the gift shop, and sure enough Kim had left her phone on the counter. After that Ryan and I went over to Universal Studios to meet the girls. We went on the Simpsons ride and then grabbed some lunch. We then ran over to the movie theater to see Harry Potter in IMax 3D. After the movie we went back to Universal for a bit – did the Terminator 3d show and then Ryan and I went back to the room while the girls went on one last roller coaster. After hanging out in the room for a bit, Ryan, Melissa, and I went to the city walk to Bubba Gumps for dinner. While we were eating, a massive thunderstorm came through and trapped us there. We stayed for dessert and then some waiting for the rain to stop. I was watching the weather radar on my phone and we made a break for it when the rain let up a bit. We got a little bit wet, and there was still quite a bit of lightning and thunder, but we made it back to our rooms ok. Check out day. Everyone elected to sleep in today. We got up around 9:30 or so, packed everything up and checked out of the hotel. We drove back to the motorhome and got it situated for living in. I also did some work on the tow bar for the Jeep. When we last towed the Jeep, I couldn’t get the bars to retract all the way. So I got out the lube and a rubber mallet and started to beat on it. I got them to retract all the way, but they don’t want to come out very easily. Hopefully I’ll be able to get the Jeep attached tomorrow. I thing the retractable bars are slightly bent, making them difficult to slide. Unfortunately, they seem to be getting worse. When we were at Camping World on Friday, I looked at a new one…only $1200. Eek! Kim and I made an afternoon run to the grocery store to get the rig stocked back up again. I also started looking at our route home. The kids all want to get home as fast as they can. Following my original pace, we’d be home late on August 1st. I did some planning with longer days, and found a pace that wasn’t too crazy and could potentially get us home by July 28th. We’ll try hitting the earlier date for the next couple of days, and if it is making people too crazy, we’ll slow down a bit. Day 29: We fixed it! Today we took the motorhome to Camping World to get the oil changed and to have them look at the water heater and the rear slideout. We got up a bit early so we could get to the RV park and move the rig to Camping World by 10a. We got things dropped off and bought a few supplies while we were there (fun stuff like holding tank chemicals). Afterwards we went back to the hotel while we waited for them to call and let us know how long it would take to fix the water heater and the slide. When we got back to the room, I started editing photos while waiting for the call from Camping World. I don’t know why I just don’t use my big camera all of the time. The pictures just come out better, and if I get a marginal shot, I can fix the raw file much easier than a jpeg. I have it set up to shoot both raw and jpeg, and the colors come out better on the raw – I wonder if I need to set the colorspace for the jpegs. After a bit we started getting hungry, so we went down to the restaurant by the pool and ordered some food. The food was good, the service was a bit slow. While we were eating, Camping World called and let us know that our motorhome was done. The water heater was just a loose wire. They said the rear slide issues was because the battery was low on water. They lubed the slide and called it good. Hopefully the issue was caused by some binding because topping off the battery isn’t going to do anything – I always run the engine while I operate the slides. Kim and I jumped in the Jeep to retrieve the motorhome. On the way, we made a quick stop at Walmart to pick up some critical supplies. As we moved the motorhome back to the spot, it started to rain (at about 1:30p). Well, it has been raining ever since. I had the news on for a bit and the central Florida area had 40,000 lightning strikes this afternoon. No parks today because of all the lightning and rain. Tomorrow, we plan to use our early entry to go back to that Harry Potter section of the park to do the last of the Harry Potter rides that we can’t express pass through. At 12:30, we’ve got IMAX tickets for the latest Harry Potter movie, and then we will probably head over to Universal Studios for the evening. Internet access is $10/day at the hotel and I left my.mifi in the motorhome, so I’m blogging from my phone tonight. I may pay for access tomorrow to upload a bunch of pictures. Today we got up at 6:40a ish so we could do early entry to the park. The first thing we did was get in line to get a wand from Ollivander’s. After waiting about an hour, we saw a cool little show of someone in our group picking out their wand. Don’t think it was worth the wait cool though. We thought you had to go through it to get the wand…turns out you can get them all over. We then went on a small rollercoaster called “The flight of the Hippogryph”. It was pretty slow and tame – even Ryan went on it. Then it was off to breakfast at the Three Broomsticks. We had passes so it didn’t take very long to get our food and drinks. The first big rollercoaster of the day was the Dragon Challenge. Unfortunately, Taylor was not tall enough to go on it, and Ryan didn’t want to go on it, so I hung out with the little kids while Kim and Melissa went. Once they were done, Ryan decided that he wanted to go, so Ryan, Melissa, and I went. It is a hanging coaster with two tracks. It keeps flipping you around so it looks like you are going to run into the other one. This turned out to be Ryan’s favorite ride so far. Then it was time to leave the Harry Potter section and head to the Jurassic Park ride. Ryan decided he doesn’t like water rides, so we left him at the stroller pickup while the rest of us went on the ride (and got soaked). We also tried to go on a log ride (that Ryan wouldn’t go on). But it broke before we got to the front. We waited for a bit, but gave up before it was fixed. Melissa and Taylor went on Dr Dooms ride, which was basically a giant frog hopper. Kim, Ryan, and I were just fine sitting that one out. The last ride that I went on was The Hulk rollercoaster. Only Melissa went with me – Taylor was too short, and Ryan didn’t want to go (Although they went on the dr doom ride – Ryan never really said if he liked it). The hulk was a regular rollercoaster that you spent as much time upside down as right side up. Both Melissa and I thought it was the best ride there. Went back to the room in time to miss the afternoon thunderstorm. Spent some lazy time hanging out, and then went to dinner ar the restaurant in the hotel. Afterwards, Melissa, Ryan, and I went back to the park for Butterbeer. We needed to put on some miles today (compared to the last few travel days anyhow), so we got up and on the road fairly early. The first problem popped up before we even got going. While I was pulling the rear slide in, it tipped up at a very steep angle. I took my finger off the “in” button immediately and it leveled itself out, and then I pulled it the rest of the way in. Tonight we’ve barely put it out so we can access the drawers. I’m going to call Camping World tomorrow and add it to the things they look at for Friday. Fortunately, tonight is our last night in the motorhome until Sunday because we are staying at the Hard Rock Hotel! Which brings me to the title of the post – I’ve only used the motorhome shower since we left Montana (so about 20 days). I’m looking forward to a real shower, with real water pressure, that I don’t have to keep turning off to conserve water and holding tank space. The drive today was pretty uneventful. We drove the Jeep separately from the motorhome so I could do a mileage test. We made it all the way to the campground before we filled up with fuel. We got 7.74 mpg, which was a bit less than I expected – most of the tank was between 55 and 60 mph over flat terrain. Doing the math in my head (which probably means it is wrong), I’d have to get about 10 mpg in order to break even driving the two vehicles separately. We made it to Saint Marys,GA, which is 1 mile shy of the Florida border (took exit #1 to get here). The campsite we are at is kind of nice – it is right next to the storage shed, but they’ve put in a nice concrete pad and a table with chairs and umbrella instead of a picnic table. Too bad it was in the low 90s with 80%+ humidity, so we opted to stay in the nice air conditioned motorhome. Went out to a bbq place for dinner tonight – Sonny’s Barbeque. It is a small chain, but they had awesome food, and the servings were huge. Just what I needed a 2000 calorie dinner since I haven’t been working out at all :). It was worth it for one night though.